AUSTIN, Texas — Austin-based singer-songwriter Bill Carter’s list of bona fides is so long, it’s hard to decide which credits to note first. We could start with his first big songwriting score, “Why Get Up?,” heard on the Fabulous Thunderbirds’ breakout album, Tuff Enuff. There’s a breakfast cereal commercial that earned the about-to-be-evicted Carter and his co-writer wife, Ruth Ellsworth, a then-huge $25,000 payday. Then there’s “Crossfire,” the No. 1 hit they wrote with Chris Layton, Tommy Shannon and Reese Wynans — a.k.a. Double Trouble, the band who backed T-bird Jimmie Vaughan’s little brother, Stevie Ray. Or there’s “Anything Made of Paper,” penned for the West Memphis 3’s Damien Echols, which Carter recorded with pal Johnny Depp and performed on the Late Show With David Letterman. Featured in the West of Memphis documentary and on the accompanying soundtrack, it’s also an award-winning animated video. Carter’s songs have been covered by scores of major artists, from John Mayall and Ruth Brown to Robert Palmer and Waylon Jennings; among his accolades is a BMI Million Air award for more than three million “Crossfire” spins. But Carter has also released several albums of his own, the latest of which, Innocent Victims and Evil Companions, bows February 26, 2016, on Forty Below Records. On this one, the artist takes blues, soul, country and rock into realms both far-reaching and familiar, aided by several A-team Austin players. They include guitarists Charlie Sexton and Denny Freeman(Dylan’s current and former, respectively) and David Holt (Joe Ely, the Mavericks, Storyville); drummer Dony Wynn (Robert Palmer, Charlie Mars); keyboardist Mike Thompson (the Eagles, together and solo); fiddler Richard Bowden (Maines Brothers, Austin Lounge Lizards); the Tosca String Quartet (everyone from David Byrne to the Dixie Chicks); and brass/woodwind player/string arranger John Mills. But it’s his resonant tenor and just-right production — and songwriting and performing chops, including his six- and 12-string acoustic guitar, harmonica and percussion work — that drive this release from the first track, “Black Lion,” to the 14th, “No More Runnin’.” Musically and lyrically, Carter references a rich past while rooting himself firmly in the present. “Recipe for Disaster,” in which he questions how the hope-filled ’60s contorted into today’s mad world, sounds like a lost Warren Zevon track (and namechecks John Lennon). Carter crafts sinfully delicious retro pop licks in “Feel Town”; “Fisherman’s Daughter,” which he describes as a love song, delivers a wonderfully loose back-porch blues/honky-tonk vibe; and “Sooner or Later” flat-out rocks. “Lost in a Day” and “Livin’ in It” suggest the Traveling Wilburys constructing a new Wall of Sound. And yes, that’s Sexton playing electric sitar on “Missing Guru,” about the still-fugitive swami convicted of sexually abusing minors in his Austin-area ashram. The far sunnier “Solar Powered Radio,” complete with Vox and Fender Rhodes tickles, could become the theme song for the Austin-area station that inspired it. Though Carter just about holds native-son status in Austin, his roots actually trace back to Kentucky, where his father, Cash Carter, was born. Cash was the son of William Henry Carter (Bill’s namesake). William Henry’s first cousin was A.P. Carter, scion of country royals the Carter Family. Bill’s bluegrass-loving father, a Navy petty officer, raised his sons in Washington state. 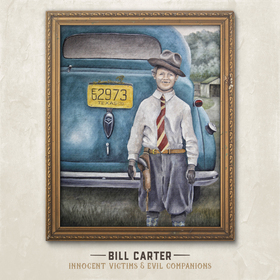 Innocent Victims and Evil Companions is Carter’s ninth self-produced album, and his first for Forty Below Records. But Carter’s songs, with and without Ellsworth (i.e., “Richest Man,” “Willie the Wimp”) can be heard on many other artists’ albums. In 2000, “Crossfire” earned them an Austin Music Award for “Song of the Decade.” In 2012, Austin PBS affiliate KLRU-TV presented an “Arts in Context” segment about Carter and his band, the Blame, that featured performances with Freeman, Wynn, Holt, Will Sexton and Cindy Cashdollar, among others, and interviews with notable names including Depp and Billy F. Gibbons. It earned producer-director Pat Kondelis an Emmy. Kondelis and Brandon Ray co-directed the animated video for “Anything Made of Paper,” which has won several awards as well. That dedication is just one hallmark of a true musician — the kind others turn to for inspiration and material. Of course, like any songwriter, Carter is flattered when others cover his songs. But there’s something special about hearing them straight from their source, and he can’t wait to unleash this latest batch. Because there’s already more where they came from.